When I became pregnant, the first thing I did was head down to the Herbivore store in search of good reading material. I remember that Michelle asked if I needed anything, and me, sort of puzzled, wondered aloud where the books on vegan pregnancy were. “NOWHERE” she exclaimed. “You should write one!” We had a little laugh about that, then had a good squeal about babies and pregnancy. That was the beginning of our friendship. And now, almost 2 years later, well . . . I took her advice! I wrote a handbook to help plant-eaters navigate their pregnancies, and Herbivore is going to publish it! 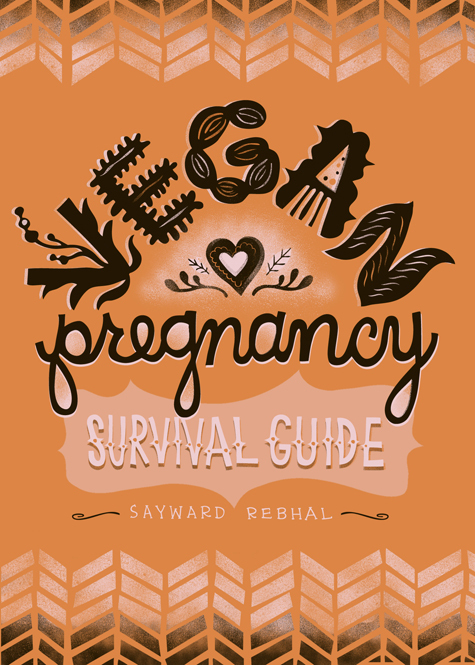 The Vegan Pregnancy Survival Guide is a comprehensive reference book that covers it all – from straightforward nutrition and strategies for maximizing meals, to choosing cruelty-free antacids and how to throw a vegan baby shower – and *everything* in between! I am thrilled to be working with such amazing, inspiring people on this project, and I’m honored to be able to share this information with the world. 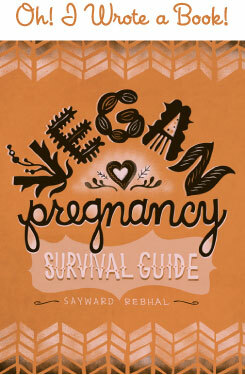 Look for The Vegan Pregnancy Survival Guide to hit the ‘shelves’ in early summer 2011! What an achievement and how exciting.Congratulations. It’s perfect timing for me! We are trying this year and I have looked for such book and found nada. I am sooooo excited!!!! also Congrats!!! How exciting! Something vegan pre-moms like me would love! That is amazingly awesome!! Congrats!!! I will definitely share! That is so awesome! I’m not even vegan and I want to get it. Yaaay! Congratulations, Sayward! I can’t wait to read it! Beautiful cover and certain to be a very interesting read. Congratulations on this exciting news! Way to go, Sayward! You are an inspiration!!! This is just beautiful! What an amazing design and great thing you’re doing! My husband & I are thinking about kids in the near future and I know I’ll be buying a copy. Sayward!! Congratulations!! I certainly will be referencing this *at some point* in the future. I’m so excited for you! Congratulations, Sayward!!! This is WONDERFUL! This is awesome! I just became a vegan and I will totally be using this in the future. Congratulations, and thanks for writing it! @ GrowingRaw – Oh man, I wish I could get you an advance! Sorry! I immediately thought I should hook you two up! Oh, this is so wonderful to see! I looked high and low for vegan pregnancy books with both of my pregnancies and was sorta depressed when I always came up empty handed. I have never doubted my choices, but it’s stuff like that- the complete lack of info + support out there- that could easily make a girl start to. Thank you!! I’d like to think that someday, maybe 20 years from now, I’ll be gifting this book to my daughter and/or sons lady. Exciting!! Any idea when this is being released yet? I just found out I am pregnant and am having a difficult time finding vegan pregnancy books. I am very interested in reading yours. It sounds PERFECT! @ Christina – Oh yay, congratulations!!! I’m hoping the book will be out by mid summer, but it’s publishing and we’re doing it ourselves and everything takes longer than expected. I’m doing my best to get it out as fast as I can. wow! congrats! what a huge accomplishment! i can’t wait to check it out! Oooh! I wish I’d had this while I was preggers with my son, Daniel, (now 1). While pregnant I became very ill and lost significant amounts of wait. (over 30 pounds in just over 2 week!) It didn’t occure to me however untill much later in my pregnancy that meat was making sick. I’d have a steak with my family and all of it would come right back up, same for burgers, sausage…any meat product I put in my mouth including eggs. By nature I’m not vegan but I respect the life style and had to flip my entire pallet just to keep anything down. It was hard, this book would have help so much! Oooh! I wish I’d had this while I was preggers with my son, Daniel, (now 1). While pregnant I became very ill and lost significant amounts of wait. (over 30 pounds in just over 2 week!) It didn’t occure to me however untill much later in my pregnancy that meat was making sick. I’d have a steak with my family and all of it would come right back up, same for burgers, sausage…any meat product I put in my mouth including eggs. By nature I’m not vegan but I respect the life style and had to flip my entire pallet just to keep anything down. It was hard, this book would have helped so much! Aw, thank you so much, and GOOD LUCK!